the various off-shoots of the harness which comes out from behind the box (if you disconnect all the pedals you could probably avoid doing this as you might be able to slide it out under them). You'll also need to drain the cylinders enough to prevent them leaking all over when you pull it. I did this with a turkey baster (can't tell you the weird looks I got when I returned to work with that in my pocket after a lunch-time shopping trip) and it worked really well, only a few drops remaining in the end which were easily caught with some carefully placed newspaper. I decided to pull out the brake pedal but leave the accelerator in place to reduce the rebuild work (you need to pull at least one as both won't fit through the hole together). The brake pedal is disconnected by removing a slit pin from inside the box and the bolt which pulls out from the side of the box. Remember you'll need to disconnect the two springs under the dash before you drop the pedal down. Now you can get to those bolts. There are 7 in total - two on the bulkhead, two on either side and one on the inside of the box near the wing. The ones in the bulkhead are truly almost inaccessible and took a fair bit of wrangling to free as you have to access the bolts from under the dash - one is above the windscreen wiper motor bolts and the other is pretty much in a corner. Both are really tough to undo and I ended up disconnecting a bunch of wiring to help me get a few more centimetres clearance with the spanner. The others are pretty easy except for the ones between the box and the wing. Why they didn't place these inside the box along with the other I don't know but these two were badly rusted, rounded off, and coupled with the tight access requiring multiple extension arms on the socket it made removing them a nightmare. In the end I even tried using epoxy resin to weld the nut to the socket but this didn't work because the rust prevented decent adhesion. The solution was getting hold of a dremel-type tool with a flexible extension arm and using this to square off the rounded edges. This finally gave the socket enough purchase to get them out. With the pedal box removed I could inspect the damage - this was where a mouse nest was when I got the car; I'd managed to pull out all the nest and treated what I could at the time. Now with full access to the area I could finish the job. It was a bit of a mess, the bottom of the cut-out in the wing was rusted away; the inner wing (what is the trumpet section) was rusted, but seemingly intact. Phew, I thought, dodged a bullet here. 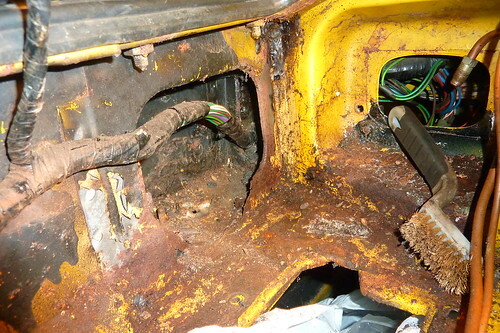 Not so - I started cleaning up the area which had sat under the brake switch. I suspect this was actually the designated mouse wee area. As I scraped around I went straight through the metal. Eek. As I cleaned up more I found more holes. In the end I had condemned the entire bulkhead floor from the heater box edge to the wing - where it wasn't holed it was thin (it was bouncy, a bit like a jam lid flexes after you've opened it). Feck. So, I'm no welder and don't have the space to practice. I was already going to get some welding done - those doglegs needed doing before they turned into full sill jobs - so I decided to see how much this would be to add on. The pain would be that the car isn't drivable so I'll have to get it trailered to and from the place which will be doing it. Luckily I know a guy who does some absolutely stellar work and has kindly fitted me in to his workload. Unfortunately this still means an 8 week forced off-road period - still there's plenty I can be getting on with! Tough bolt - under the dash.